This hike begins off Forest Road #9327-040 which is a short drive off FR #93. The trail head is well marked and parking is adequate. Be aware that this trail permits the use of motor bikes, so the trail has that distinctive V shape. This does make the hiking more difficult. The trail starts fairly level but increases continually in steepness for the first 3 miles. In season this hike is surrounded by a grand display of wildflowers. At first you will hike along old logging roads turned trail, but after about a mile things get steeper and at 2 miles you come to the junction of Trail #17. Much of the trail is in dense timber for the first 3 miles, but as you gain elevation you also gain greater open areas and vistas. At about 3 miles you will leave a wooded area and you may glimpse Blue Lake through the trees about 400' below you. The trail levels off a bit now and for the next mile or so you will walk through meadows and open areas and cross an occasional stream. Again the wildflowers are abundant in season. Not only will you be offered great views of Mt Adams along this stretch of trail, but from time to time you will have glimpses of Mt Rainier, Shark Rock, Kirk Rock, Craggy Peak, and Mt St Helens. At about 4 miles you will come to a pond on the left. The trail then climbs above and away from the pond offering views of Mt St Helens over the top of the pond. At about 5.5 miles you will come to the junction with Boundary Trail #1. For this narrative I took the trail to the left and passed Craggy Peak along the west side. 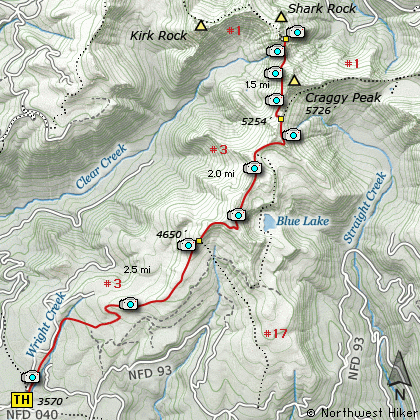 In about 3/4 mile you will come to the saddle between Craggy Peak and Shark Rock. It is just a bit further to the base of Shark Rock where you get excellent views of Mt Adams and Mt Rainier. From Woodland follow SR 503 and the Lewis River Road for about 48 miles to the community of Cougar, WA. From Cougar, continue east on the Lewis River Road which will turn into Forest Road 90 after you enter the Gifford Pinchot National Forest. In about 18.5 miles you will come to the junction of Forest Road 25. Continue straight ahead on FR25. From the junction of Forest Road 90 and Forest Road 25 at the far eastern end of the Swift Creek Reservoir, head north on FR25 for about 5.5 miles to the junction of Forest Road 93. Bear right and follow FR93 another 13 miles until you come to Forest Road 9327. Bear left onto FR9327 and follow it north about a half mile to the trailhead for this hike. If however, you plan to approach this hike from the Columbia River Gorge area, then begin at Carson, Washington and head northwest on the Wind River Hwy. In 7.5 miles you will pass through the little community of Stabler, and in another 5.8 miles you will come to the junction of Forest Road 30. Turn right onto FR30 and follow this road for 13.2 miles north along the Wind River and then up a steep incline and onto a plateau where	you will come to the junction of the Curly Creek Road. Turn left onto the Curly Creek Road and follow it downhill past an excellent view area for about 5.1 miles until you come to Forest Road 90. Turn left onto FR90 and follow it west for another 4.1 miles until you come to the junction of FR90 and FR25. Turn right onto FR25.